This year’s figures reveal improvements in the tourism sector, with an increase in holidaymakers to Egypt from both regular and new markets. Russian flights are landing in Cairo once more, two years after the crash of a Russian plane over the Sinai Peninsula in October 2015 led to a temporary ban. But better skills and more creative marketing are still needed to continue the revival of the tourism sector, said Elhamy Al-Zayat, former head of the Egyptian Federation of Tourism Chambers. 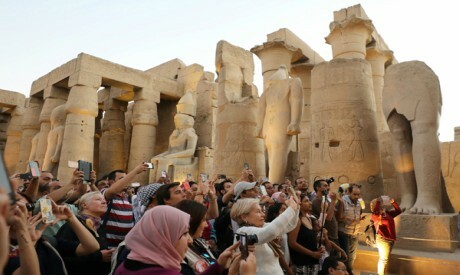 The numbers of tourists coming to Egypt from the Americas, Australia and Canada increased, as did holidaymakers targeting cultural tourism, Al-Zayat added, the result of improvements in Egypt’s image abroad. Hotel prices improved over previous years, although they remain less than they were in 2010. Five-star hotel rooms in Cairo can be reserved for $160 to $170 per night, down from $200 eight years ago. Over the last few years they could be reserved for as little as $90, Al-Zayat explained. Improving services for holidaymakers is the key to attracting more tourists, he said. “We are at a crossroads. We have to find more skilled labour as soon as possible and fix hotels that may have deteriorated over recent years,” Al-Zayat added. Tourism revenues in 2017 were $7.6 billion, up from around $3.5 billion in 2016. Revenues from the reviving sector during the first half of this year came in at $4.8 billion, Reuters has reported, adding that tourists have increased by 41 per cent to reach around five million, up from 3.6 million during the same period in 2017. After a three-year contract between the Egyptian Tourist Authority and the advertising agency JWT expired, local advertising agency Synergy and international agency IPG/MCN teamed up to promote Egypt more efficiently in global tourism markets. The new consortium includes Universal Media, which is promoting the ministry of tourism’s strategy and books broadcasting and advertising spaces in the international media. It also includes Weber Shandwick, a global public-relations company, which manages PR services and crisis management. Joining the consortium is FP7/MCcann/Craft, which specialises in managing social-media platforms and developing and marketing digital content to suit each market. There is also Jack Morton, a branding agency with expertise in curating international events, and Initiative Media, in charge of digital content. The present campaign has three phases: changing images not only about Egypt, but also Egyptians, the focus of a “People to People” campaign that will be launched soon; inaugurating the Grand Egyptian Museum in 2020; and promoting each city’s trademark features. According to Rania Al-Mashat, the minister of tourism, Egypt is working on creating its own trademark features at pavilions at international exhibitions. She said that the image of Egypt’s pavilion at the World Travel Market in London will be maintained at ITB Berlin and the Arabian Travel Market. Branding by destination is one of the methods Egypt is counting on to market tourist spots such as Siwa, Luxor, Aswan and Sharm El-Sheikh, all intended to display the country’s diversity, Al-Mashat added. Ali Al-Manesterli, member of the board of the Chamber of Tourism Companies and head of the Tourism Chamber in Alexandria, said 2018 had seen noticeable improvements in the number of tourists coming to Egypt, notably from East Asian countries such as Indonesia and China. He believes focusing on these markets that export large numbers of vacationers will increase Egypt’s revenues from the sector. Nora Ali, a former chair of Egypt’s Federation of Tourism Chambers and president of the Master Travel Agency, said 2018 also saw a rise from regular markets, such as Germany. Ukrainian tourists have increased dramatically in number over the past few years, filling the gap left after Russia banned flights to Egypt following the 2015 crash of a passenger plane in Sinai. Ali said that 2019 will bring in more tourists to the country on condition that Egypt launches top-notch promotional campaigns in its regular tourism-exporting markets and embarks on extensive marketing in promising markets like China that exported large numbers of tourists to Egypt in 2018. Regular markets such as Germany and the UK increased their tourist numbers to Hurghada and Marsa Alam, Ali said, adding that there had also been a noticeable increase in tourists from smaller markets such as Serbia thanks to efforts made by Red Sea Governor Ahmed Abdallah who worked on extending an air bridge between Serbia and Hurghada. Moody Al-Shaer, a member of the general assembly of the Chamber of Tourism Companies, said that despite this year’s good figures, tourist numbers would not reach those of 2010, the year tourists and tourism revenues peaked in Egypt. Some 14.7 million visitors came to Egypt in 2010, bringing in revenues of nearly $12.5 billion. Al-Shaer believes Egypt should focus on promoting its tourist destinations in emerging markets such as Serbia, Kazakhstan, Romania, the Czech Republic and Poland. It also needs to re-embark on joint promotional campaigns between the Tourist Authority and tour agencies in various markets. The halting of these campaigns had negatively affected Egypt’s revenues from tourism, he said. The resumption of Russian air flights to Cairo after the two-year ban had not led to a large increase in the number of tourists coming from Russia, Al-Shaer said, since these flights are often used by businessmen. This year Russia, still Egypt’s largest exporter of tourists, lifted a ban that has been in place since 2015 on flights to Cairo. The ban is still in force to resorts such as Sharm El-Sheikh and Hurghada, however. The biggest challenge to the tourism sector in the coming year will be to launch creative promotional campaigns in tourism-exporting markets so that Egypt stands on an equal footing with its competitors, and to lower the airport fees that still form an obstacle to attracting airlines to tourist resorts.